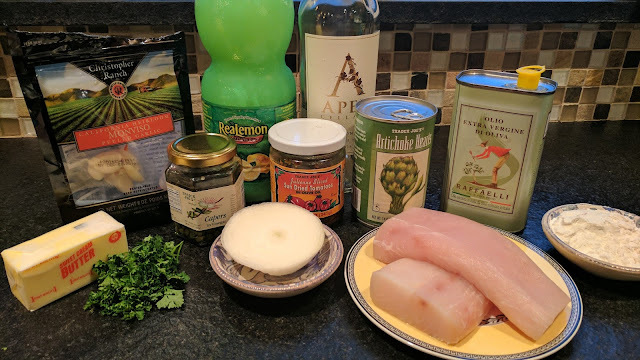 I love Mahi Mahi, a tender but firm fish that lends itself to many great flavors. I buy the Costco frozen individually wrapped fillets and have on hand in for a quick and healthy weekday dinner. This recipe would also be great for entertaining the weekend too, as it's got a special feel about the dish. 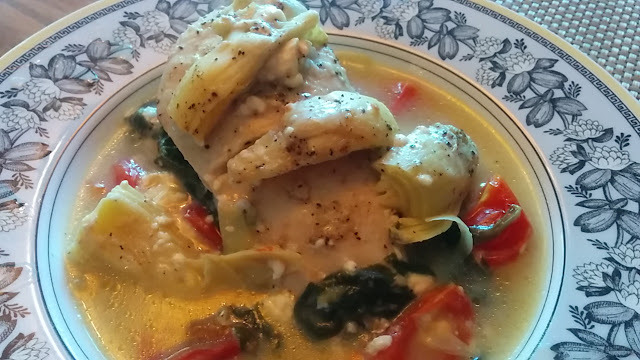 I found the original idea on All Recipes when I Googled Mahi Mahi and artichoke hearts. While the idea was great, there were some very strange proportions that needed some help. You'll be happy to know I cut down on the fat by reducing the butter, also, the garlic was way over the top with 1/4 cup! I also added capers and eliminated the extra salt as the capers and artichokes are salty enough to flavor the whole dish. I intend to make this one again and again, it was delicious.We served it with zucchini "noodles" but real noodles, or even rice would be nice with the sauce. Heat olive oil in a separate skillet over medium heat. 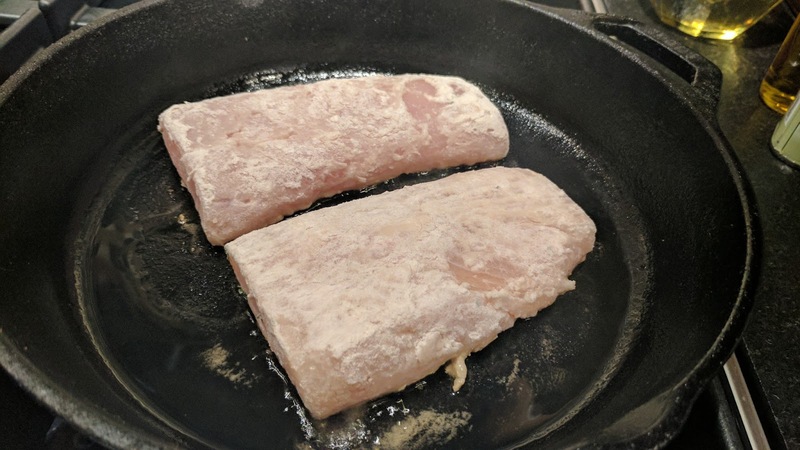 Pan-fry mahi mahi in the oil until the fish flakes easily with a fork in the center, 3 to 5 minutes per side. Transfer mahi mahi to a platter and tent with foil to keep warm. 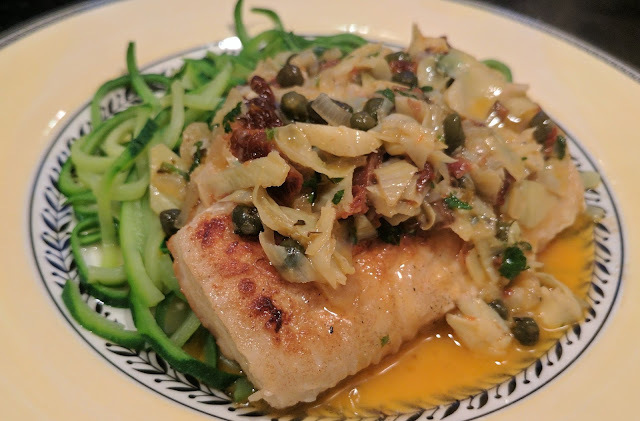 While the fish cooks, make the sauce. Melt 2 Tbsp butter in a large skillet over medium heat. 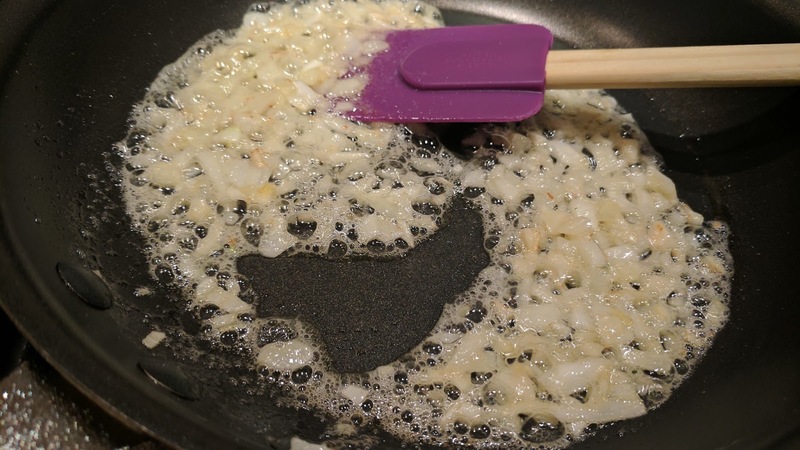 Cook and stir shallot (or onion) and garlic in butter until soft and fragrant, about 5 minutes. Pour lemon juice and white wine into the skillet. Simmer the liquid a for about 3-4 minutes. 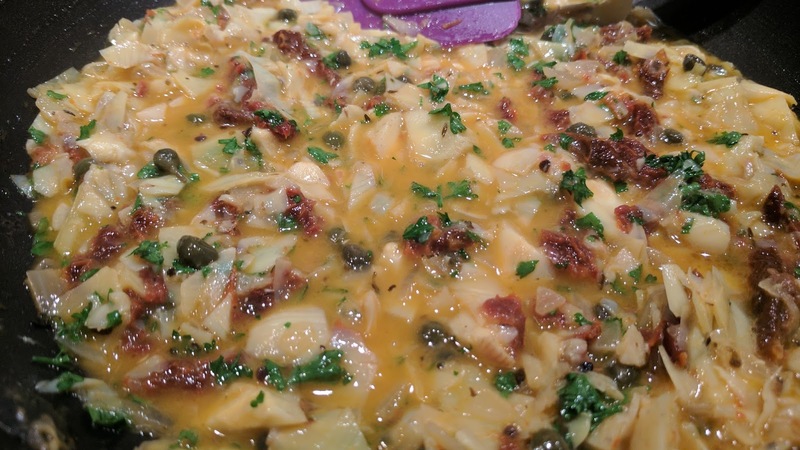 Stir tomatoes, capers & artichoke hearts into the sauce; cook until warmed, 2 to 3 minutes more. Remove skillet from heat, add cold butter pieces and parsley, and swirl skillet off heat until the butter melts and emulsifies into the sauce. Add the parsley, and top the fried fish with sauce and serve at once. 2016 was a very good year for me personally as well as my blog. I had more traffic to the blog than I've ever had. 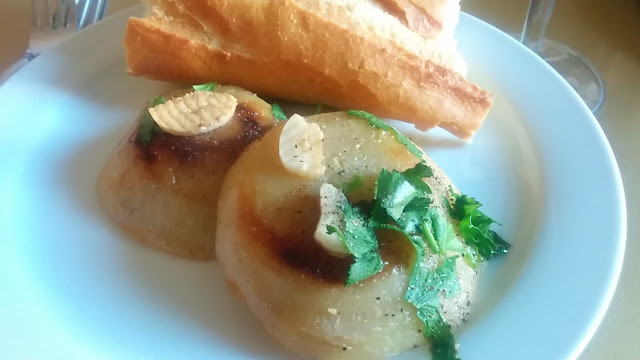 This is now my 5th anniversary of food blogging, which seems like such a long time, but then again, it has gone so fast too. 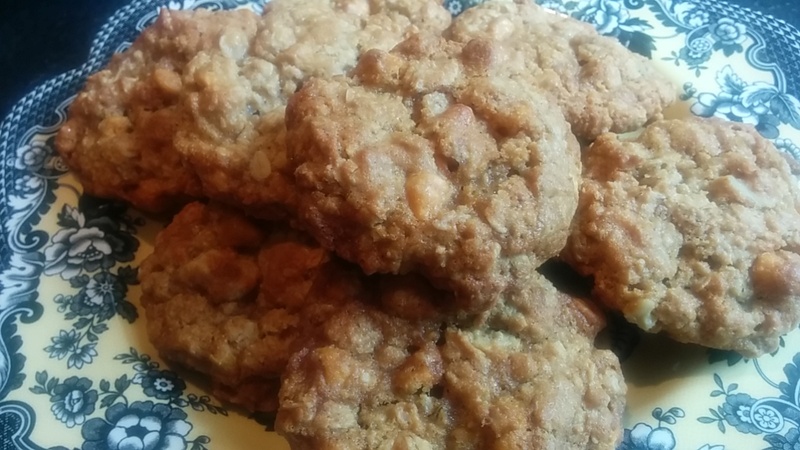 I still enjoy cooking and writing about it... with as much travel thrown in as possible too! I didn't do as many posts as I have historically, but working full time and taking some night classes can wear a girl out. It's a crazy variety of recipes that made my Top 10 in 2016, but here they are! 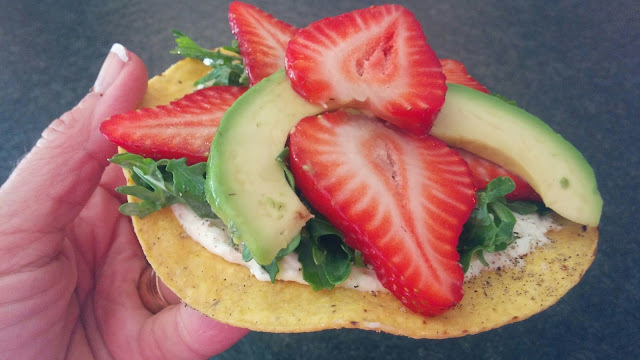 I received a call out of the blue from the California Giant Strawberry farmers, asking me to create a recipe for their fresh berries. I received a huge book of fresh strawberries shipped to my door, which is quite inspiring for sure! I had a blast and earned a little cash. I really thought of something outside of the norm for doing with these berries, this was a fun, fresh and different appetizer to have. It all started with a huge bunch of leftover croissants. Everyone knows they get a little stale after the first day, and honestly, how jazzed can you get about leftover croissants over and over? 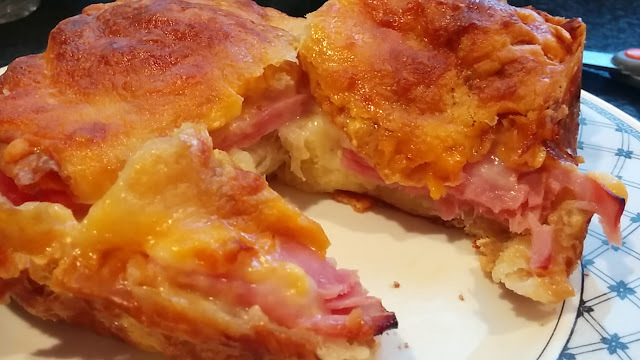 Well, I must say they taste quite terrific made into ham and cheese sandwiches, soaked with eggs and baked as a casserole. A keeper for sure. Just something I made for work one day, they taste pretty terrific, I must say! Made with love for my darling daughter. It's the soup she likes best! One of those meals where you have a pork tenderloin to cook but no inspiration... hmmm, a couple of apples hanging in the fruit bowl as we didn't like the texture. 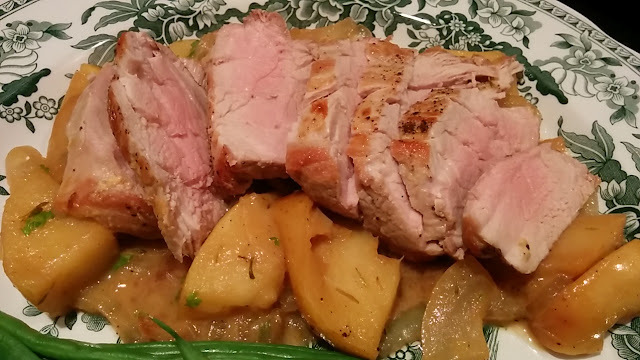 Roasted and sauteed up with onions, those apples became the best side dish/seasoning for roasted pork tenderloin. Another inspiration from a long weekend in the Columbia River Gorge and a great lunch salad that I had on a beautiful sunny almost Fall day. 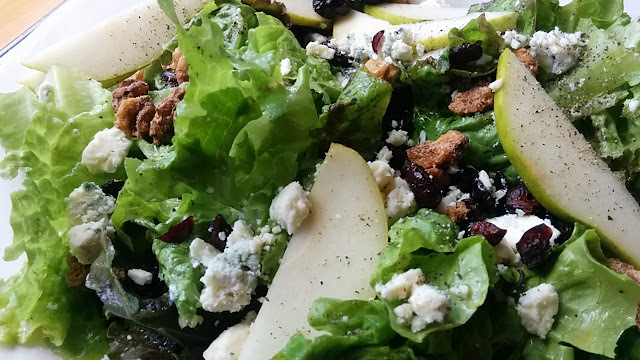 Pears, Blue Cheese and Pecans are augmented deliciously with a bit of maple in the dressing. 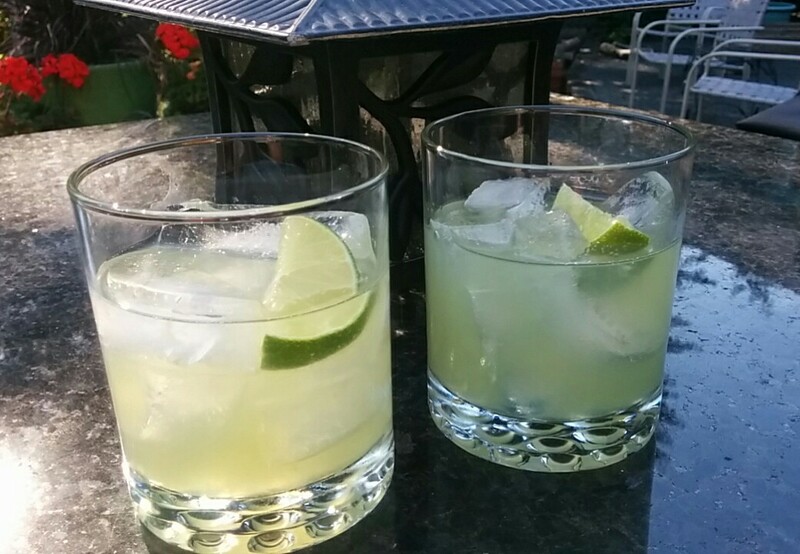 Inspiration from the Summer Olympics in Brazil, a very yummy cocktai! I had a great business trip to Germany, including Munich's Oktoberfest and remembered a great burger I had in our own Leavenworth Bavarian village. Very soon we were eating Bratwurst burgers of our own! We had a wonderful time in Venice with our good friends, renting a darling 2 bedroom hotel room complete with a mini kitchen and living room with balcony's overlooking the canal. Seemed like the perfect dish to make in Venice. It was. Sometimes the best "keeper" recipes are born from laziness... this is one of those. 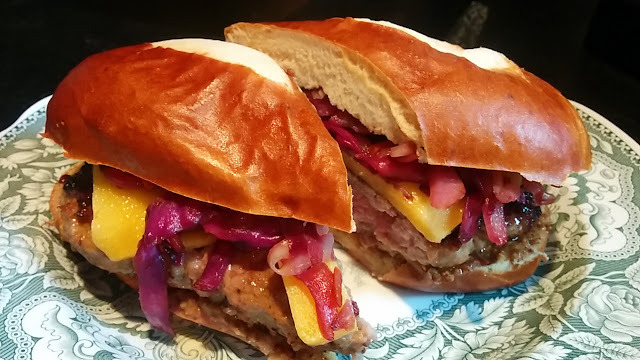 It tasted delicious and more complex than it took to throw it together. I highly recommend this! 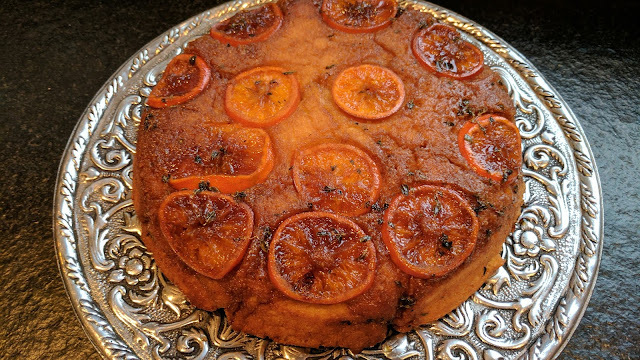 This is a somewhat unusual cake with cornmeal, thyme and caramelized oranges and I really, really loved it. Thyme might be a little different item to put into the cake, but it added a taste nuance that I enjoyed. If you don't have any, or you're unsure you'd like, by all means, leave it out. I made it for a family function, and we ended up going out for dinner and when we returned to the house, everyone was too full for dessert. I cut the cake into wedges and sent it home with people. I cut my piece into wedges and took it for my work breakfast, throwing it in the microwave to heat up a bit to enjoy with coffee. I was kind of amazed at how enjoyable it was. Thick and dense, not too sweet with great flavors from the caramelized oranges, thyme and hints of vanilla. 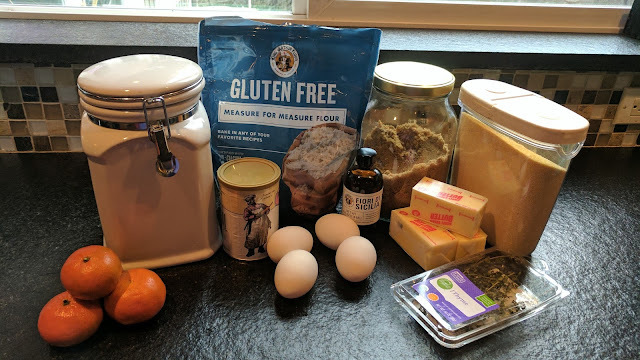 I used King Arthur brand Gluten Free flour, Measure for Measure, which is by FAR the best GF flour I have ever used. You can always use regular flour if you don't need GF. 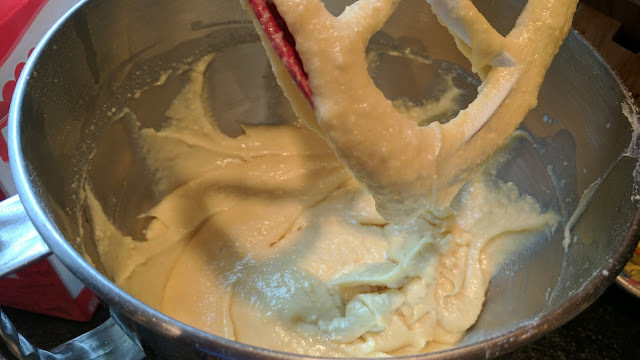 Preheat oven to 350 degrees F. For batter: In a medium bowl stir together the flour, cornmeal, baking powder, and 1 tsp. salt. 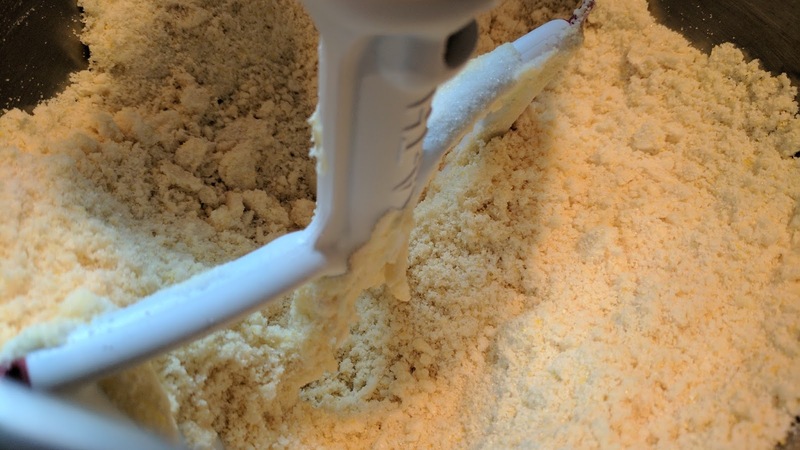 In a large bowl beat the 3/4 cup butter with a mixer on medium to high for 30 seconds. Add granulated sugar. Beat 1 minute or until fluffy, scraping sides of bowl occasionally. Add eggs, one at a time, beating after each until combined. Add milk, beating until just combined. Stir in the orange zest and the 2 tsp. vanilla; set aside. Heat a 10 inch (what I used) or 12-inch cast-iron skillet over medium heat for 1 to 2 minutes. 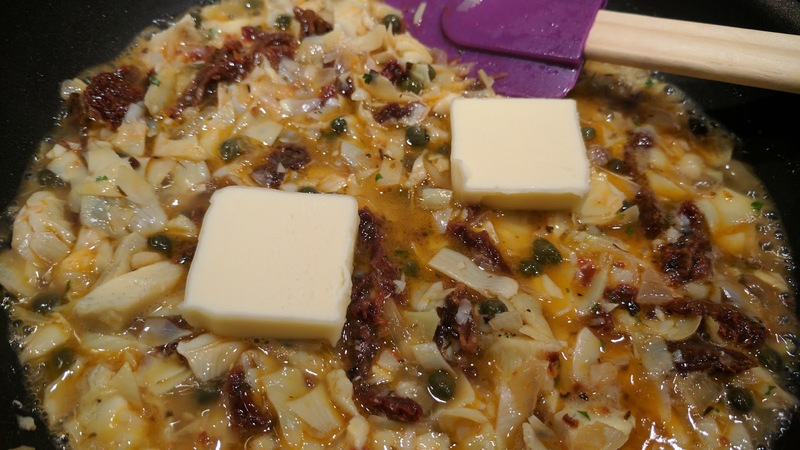 Add the 1/2 cup butter. Stir the butter around until melted and the bottom of skillet is coated. 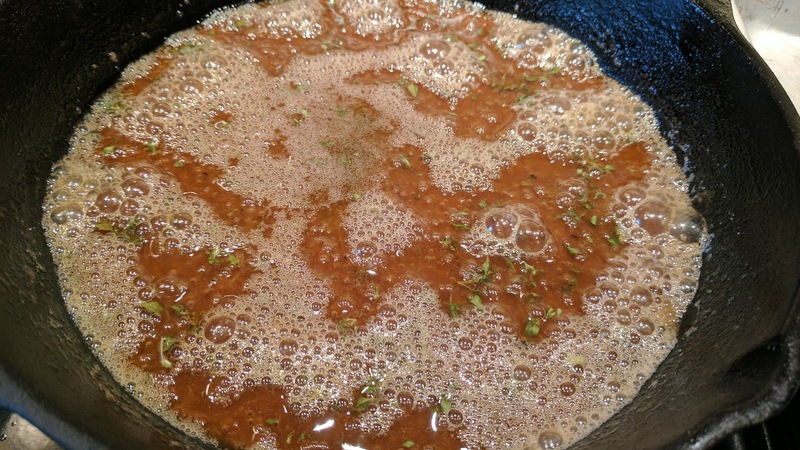 Whisk in the brown sugar, 11/2 tsp. vanilla, and 1/8 tsp. salt. 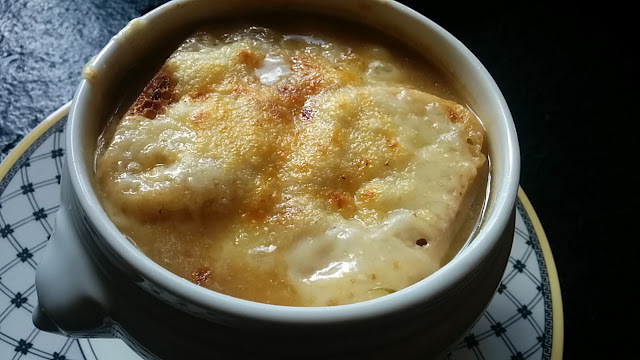 Bring to boiling; boil 1 to 2 minutes or until thickened and caramelized. Stir in the thyme leaves. Remove from heat. 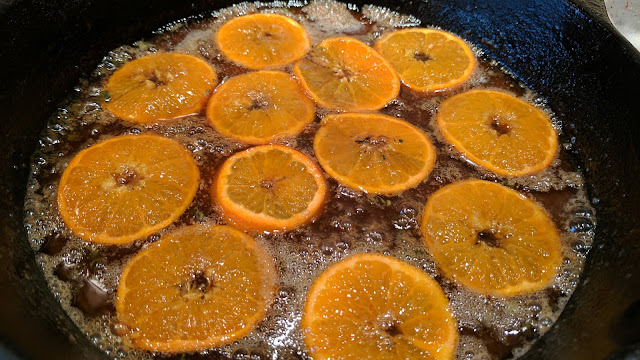 Lay the orange slices in one even layer in the bottom of the skillet. Spoon batter over orange and butter mixture; spread evenly. 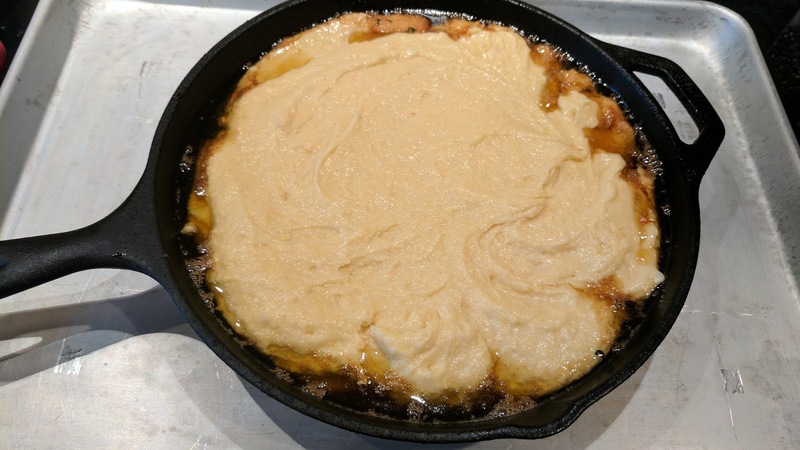 Put skillet on a baking sheet* and bake 45 to 50 minutes or until top is golden and knife inserted near center comes out clean. Cool in skillet 5 minutes. 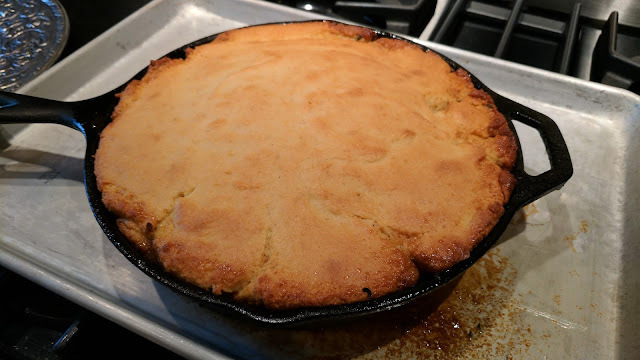 Invert onto a serving plate; transfer any fruit stuck in skillet to cake. Cool 20 minutes. Garnish with thyme sprigs. *The butter mixture will most likely drip from the pan, this will avoid a big mess in the bottom of your oven.